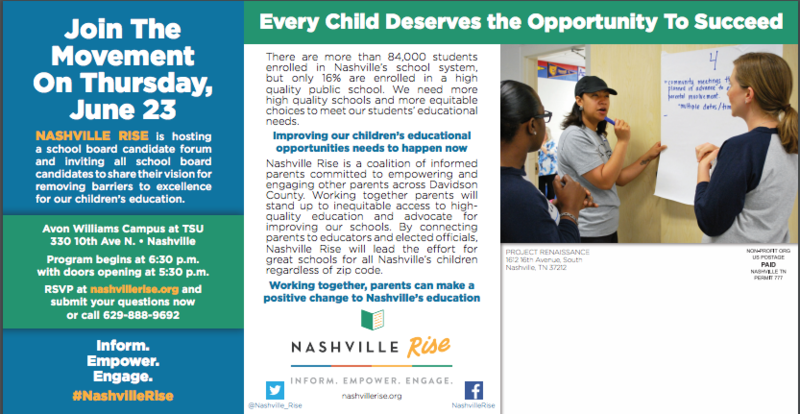 Nashville Rise, a grassroots group of parents who are trying to elevate the parent voice in Nashville, is hosting a school board candidate forum later this month. Who will be there? School board candidates from each district that is up for election this year. Who is moderating? David Plazas, the Opinion Editor for the Tennessean will be moderating. There will also be a panel of parents there to ask the candidates questions. I love that there will be a panel of parents asking questions! Parents involved with Nashville Rise have been going door to door to invite parents and community members to attend the forum. In preparation for the event, Nashville Rise has released a TV ad and direct mailer to invite community members to the forum. I hope to see you on June 23rd! 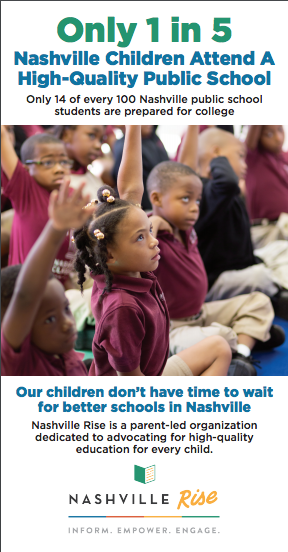 This entry was posted in Campaigns, Forums, MNPS and tagged Nashville RISE, Nashville School Board, Parent Voice, Tennessee Education Report, TNEdReport, Zack Barnes. Bookmark the permalink. Rise is an offshoot of Project Renaissance, which has an estimated income of a million dollars or so (http://givingmatters.guidestar.org/profile/1147565/project-renaissance.aspx). I’d hardly call that grassroots. Agree 100% with Aaron. Renissance says on its own website they are creating a grassroots parent organization. If a corporate reform funded organization is manufacturing a parent organization that is not grassroots. Not to mention the fact that no “grassroots” parent organization has the mo eye to fund TV commercials.